The other day, I was walking down the Alameda, which is the main street in Santiago, such as it goes from Plaza Italia, down to join highway 68, which, if you are lucky, takes you to wineries and the coast. The Alameda (real name: Avenida Libertador Bernardo O’Higgins) is a large thoroughfare, sometimes six lanes wide, and down where I live, you have to take a running leap if you want to try to cross the whole avenue in one change of the traffic light, as opposed to getting stranded in the mid-block “calzada” or park block/traffic island (depends on where you are). It was here on the Alameda that I came across this lovely hand-chalked sign at the café beside the Cine Arte Alameda. The Cine Arte Alameda is a place I have great fondness for to begin with. They show indie movies, occasionally host craft fairs, and two of my friends have screened their documentaries there. They have bike parking inside, and occasional concerts upstairs in a part called “El Living” (the living room). Inviting nursing mothers to come in and have a seat, and nurse babes in arms (or on feet) as they like. What a nice sign I thought! I had seen a photo of a similar one, and I thought then (as I did on this occasion), yes, it’s hot and sweaty and tiring to be out on the street, and you should be able to find a peaceful place to feed your baby. I don’t have a baby, but I appreciate this kindness extended to strangers. What a lovely sign, that makes you stop in your tracks and take a picture, thinking about the buena onda (sort of like “good vibes”) in the world, even if they’re not meant for you, precisely. The sign was especially poignant because the day before, I’d been at a decidedly more uptown location, a restaurant with a fancy wine list and French food, and if you know the place I’ve said enough, and if you don’t, it doesn’t really matter. At that place, I saw this other sign. How… something. Cozy? no, that’s not the word. Welcoming? No, that’s not it either. Okay, so first of all, this restaurant gets beaucoup tourists, because it is in every guidebook and every website that covers Santiago. Tourists come and spend money, and tip well. So it’s not bad that they’re there, right? You’d like them to speak Spanish. Fair enough, it is stressful to be spoken to in a language that you don’t understand (presumably some of the staff). But how about, “Hey tourists, we promise not to make fun of your accent if you speak Spanish,” or “Don’t be shy, speak Spanish!” The way it’s phrased, it sounds a bit like “Speak Spanish or go home.” Also, with the exception of Brazilian tourists, the tourists that are not speaking Spanish probably cannot read the sign. So what does the sign accomplish? Does it make tourists feel good? No. Does it make me want to patronize this restaurant again? Not particularly. The sign just seems mean-spirited, and generates a wave of microaggression, rather than offering something helpful. How about some Spanish lessons? “Por favor, quiero el X” (Please, I would like the X), or whatever it is that people are not saying correctly or at all in Spanish. 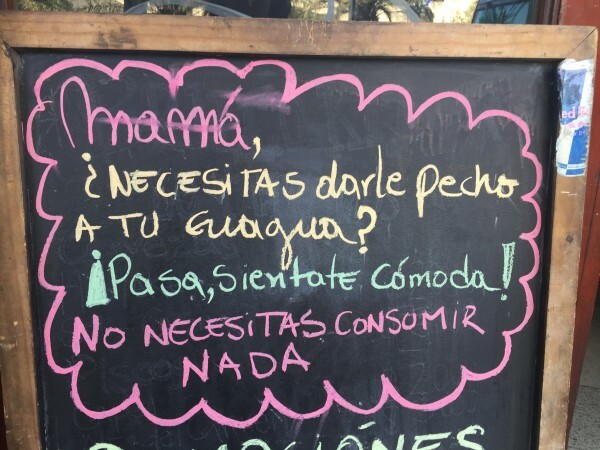 And speaking of Spanish lessons, I have one for you, passive aggressive sign-writer: The names of languages are not capitalized in Spanish, which means tourists are not the only ones that could use some practice. And to my irony-inclined dinner companion (who speaks Spanish) who walked up to the hostess and asked her point blank, and within inches of the sign, “Where’s the bathroom?” This one’s for you. Perfectly in keeping with Baco’s previous snotty signs. I remember, during my first week in Santiago, being irritated by the one about their (lack of) internet – something like ‘no tenemos wifi, hablen entre ustedes.’ How lovely for you to chide me for wanting to take a second and look something up on my phone prior to sorting out the whole Virgin Mobile SIM card thing. If it wasn’t for their Bearnaise sauce, I’d have never gone back. Who said anything about Baco? (just kidding). Also, hi! I have been there seldom, as I don’t find it very interesting, to be honest, but the food is tasty enough, I suppose. I was there at the behest of another friend. Wine served at right temperature, nice ambience, but not precisely my jam, you know? What better way to discourage people from speaking Spanish. I’ve always felt that the reason I was able to learn is because of the massive numbers of Salteños who are incredibly kind, helpful and oh-so-very patient. That they would rather offer a thesaurus level of word options in Spanish in order to avoid speaking English also helps. But then, since the sign was in Spanish anyway… oh well. Did they get upset at your friend? Oh, I hope so. no, I think they answered her in English, but she was just being sassy, she knew where the bathroom was, anyway! Shouldn’t it be castellano anyway? well, indeed it should. Unless they’d like to be spoken to in Castilian Spanish. Which I seriously doubt! I was pretty surprised to see everyone’s reaction to this sign. 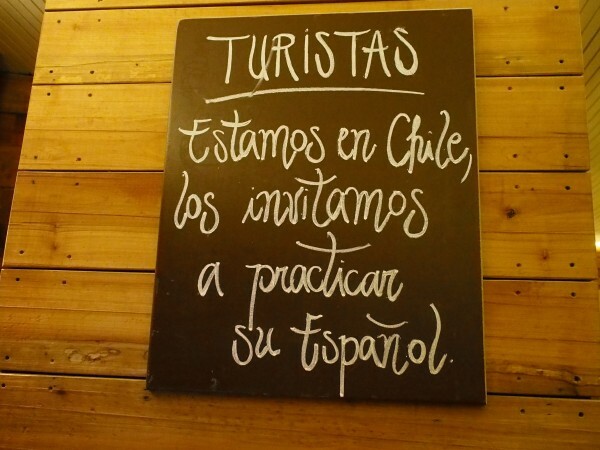 I read it and my thought was, “What a nice inviting sign 🙂 The Chilenos know that we want to practice our Spanish, that’s so nice of them! – “Speak Spanish or go home?” I didn’t see that. Let me practice because puedo hablar chileno en un restaurante. “Oye flaite! Da me la meñu chingada, huevon!” Perfecto, sí pue? um, fairly offensive and likely for you to get your food spit in, plus we don’t say “huevón” (it’s weón) chingada or pue, but you can try if you must. Suerte!